DaBomb Sports Grill is a locally-owned and operated sports bar in Lithonia Georgia. We originally established our restaurant in 1998 in downtown Atlanta and became famous for our tasty and delectable hot wings. By 2002, we had become Lithonia's best place to meet for sports, food, drinks, and entertainment. We completely transform at night after 9:00 p.m. into a bar, restaurant, and nightclub to meet the needs of our customers in the area. Our establishment provides a live DJ every night to pump up the night and get people on the dance floor, but you're always welcome to stop in just to have a late night meal or a drink and enjoy the big game on our wall-to-wall TVs. We have many events and parties going on throughout the week. Come on down to our bar and grill in Lithonia, Georgia, and find out why our customers love us so much. We've got something for everyone here at DaBomb Sports Grill and want you to come in and discover your new favorite meal and drink. Our lunch and drink specials, as well as our calendar of amazing events, make us the place to be for any big sporting competition or TV show viewing party. You won't find better hot wings or boneless wings anywhere else in Lithonia, Georgia. 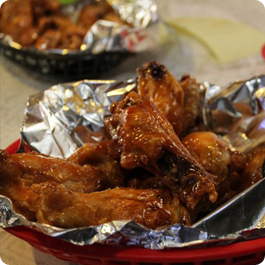 If you love wings as much as we do, we offer over 31 different flavors and a variety of dressings for you to enjoy. Our menu offers delicious appetizers and meals that you can't find anywhere else and we take pride in the enticing food that we prepare for our customers. 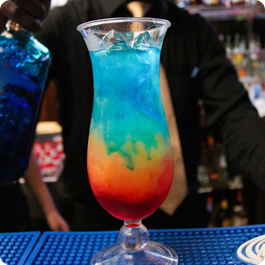 Our extensive drink menu has something for everyone. From beer to champagne, we have the drink for you. 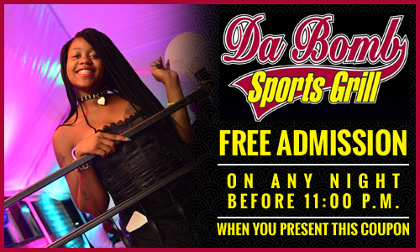 Schedule your next big party with us and you won't be disappointed with how much fun you and your guests have at DaBomb Sports Grill. We have everything from Bud Light™ and Heineken™ to Ace of Spades™ and Cuervo Gold™ Margaritas, so stop in today. DaBomb Sports Grill is locally owned and operated. A local bar and grill that features a daily Happy hour from 3:00 p.m. - 9:00 p.m. This includes a $3 drink menu and 10 wings for only $5. Plan your next big event or small meet-up at our location for a successful and fun party. We have a large selection of top-shelf liquors, foreign and domestic beers, champagne, and red and white wines that will keep you, your friends, and your family happy and satisfied until last call. Although our business is smoke-free we do have hookahs available and allow you to smoke smokeless E-cigarettes on the inside. We offer a very comfy outdoor patio for our customers who are smokers. 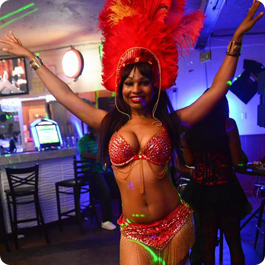 We charge a nominal cover fee usually $5 to $10 on certain nights and for big events at our bar. DaBomb Sports Grill is always the best place in the area to watch the Atlanta Falcons, Hawks, Braves, and Georgia Bulldogs play on our big-screens! Schedule your next big party or celebration at DaBomb! Prices start as low as $25.00 and vary depending on the size of your party, theme, and type of bottles. Contact us today! Or call our private party line at (470) 226-1695! Won "Best Wings in Atlanta" From Wing Fest in 2007. $7 Wings, $3 Drinks, 3:00 p.m. - 9:00 p.m.
$1 Frozen Margaritas Every Monday from 7:00 p.m. - 11:00 p.m. Doors open at noon. $7 wings $3 Drinks $9 pitchers. Come Early. After Party until 3:30 a.m.